This is the second part of a two part biography of William Holt Yates Titcomb (1858-1930), produced to accompany the 2003 Titcomb Retrospective at Penlee House Gallery & Museum, Penzance. Titcomb was an acclaimed figure painter, who had 44 works hung at the Royal Academy and whose work is represented in Public Galleries in Toronto, Nottingham, Bristol, Truro, Doncaster, Oldham, Southport, Dudley and the V & A. This second part covers the years 1909-1930. In 1909, Titcomb and his family returned from Germany and settled in Bristol. 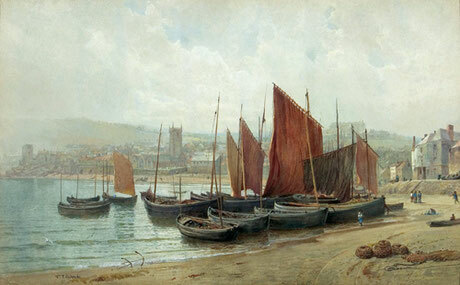 A distinguished figure, such as Titcomb, was warmly welcomed into Bristol art circles, and the Bristol Academy was keen to use his contacts with the Cornish artists to persuade them to exhibit more regularly at Bristol. He seems to have had some success in this regard, for the number of Cornish exhibitors increased significantly at this time, so that when a royal charter was obtained in 1913, the Academy was re-named the Royal West of England Academy. Titcomb also joined the Bristol Savages, becoming President in 1917, and held painting classes in Clifton. Up until this juncture, Titcomb had worked almost exclusively in oils, but a commission to illustrate, for his friend, the writer, Charles Marriott, a book, The Romance of the Rhine, not only inspired him to work more regularly in watercolour, but also tempted him to consider producing his own book on the buildings of Old Bristol. Accordingly, his subsequent exhibits at the Bristol Savages contain a number of watercolour drawings clearly intended for such a book, such as of the Old Blind Institution at the top of Park Street, or the Merchant Tailors’ Almshouses on Merchant Street (Bristol Art Gallery), albeit the project never came to fruition. During his first decade in Bristol, Titcomb still produced for the Royal Academy a number of significant oil paintings. Initially, he was fascinated by the quaintly-attired inmates of a number of the philanthropic institutions in the town, such as the Muller Orphanages at Ashley Down and the Blue Maid Orphanages at Hooke’s Mills, where the girls were trained for domestic service. With his interest in faith, other churches in the city caught his attention and, again, it was the Anglo-Catholic ritual practised in St Stephens by the Reverend Ernest Houghton, which was the subject of another work, The Reading of the Gospel : Old Bristol Church (RA 1916) (St Stephens). Titcomb also depicted the local boy scout group on various occasions, perhaps because Frank (and other Clifton boys) had joined, and showed at the Royal Academy in 1913 a major work, Cheering the Chief Scout, showing the boys welcoming Baden-Powell in Dowry Square, Hotwells - most probably during his 1910 visit. With the outbreak of War in 1914, the art market unsurprisingly died and art concerns seemed trivial alongside the horrors being reported. Titcomb’s scout painting was seen as having good propaganda potential and was re-named Send Us!. With outdoor sketching restricted, Titcomb turned his attention to historical reconstructions and imaginative work, including several war-related subjects, of which the fine The Soldiers’ Communion, showing a group of soldiers kneeling before a makeshift altar set up on planks just behind the firing line, now hangs in the Ante-Chapel at Clifton College, for many of the models for the painting were boys at the School, who subsequently lost their lives in the War. Titcomb’s son, Frank, was one such casualty, crashing in 1917 in thick fog during his first solo flight with the Royal Navy Air Squadron. The loss of their son and heir, who had shown great talent as a musician, devastated the Titcombs. He forced himself to finish one of his largest and most impressive works - a historical reconstruction of John Wesley preaching in the Lord Mayor’s Chapel in 1788 (RA 1918 - Lord Mayor’s Mansion House, Bristol), but, thereafter, gave up painting large oils almost entirely, spending the last decade of his life working in watercolours and leaving Bristol for extended tours of the Continent, finding Venice a particular inspiration. In 1925, he staged an exhibition of 89 watercolours at Walker’s Gallery in New Bond Street in 1925, which was well received and visited by the Queen. 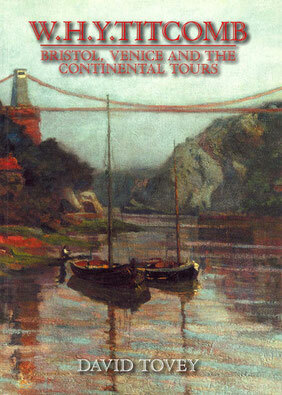 After a spell in Menton in the South of France, he died in Bristol in 1930. A humble man, uninterested in self-publicity and art politics, Titcomb’s art has been sadly neglected, but the 2003 Exhibition received rave reviews (see St Ives Art Exhibitions).